Twa bridies, a plen ane an an ingin ane an a. 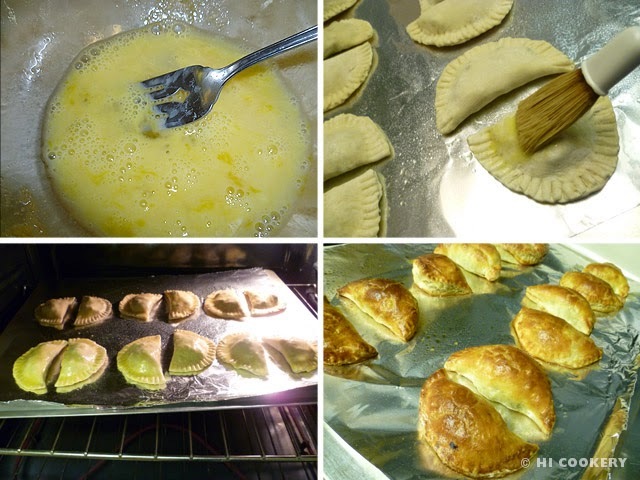 We have blogged before about empanadas, pierogis, turnovers and dumplings from different cultures. This particular post focuses on the Scottish savory version—a meat bridie. We usually snack on meat bridies at the Scottish festivals that we attend across North America. Those portable pies are convenient and filling while roaming around the fairgrounds. Though they look like a casual cuisine, meat bridies are also served at weddings, as they are appropriately named for the “bride” (a word possibly derived from the Celtic Saint Brigid). Moreover, its horseshoe shape is considered lucky—especially if it is in the up or U position—and is symbolic of the woman’s womb (bridal fertility). We also make and serve mini meat bridies to the brides and grooms we sponsor from our church during marriage preparation meetings with them. They appreciate the trivia of this traditional treat associated with the Scottish snack from Highlander’s heritage. Make some mini meat bridies for bridal showers, teatime, picnics and National Empanada Day. In a skillet, heat the oil and brown the onions with thyme leaves for about 2-3 minutes or until the onions are soft and golden. 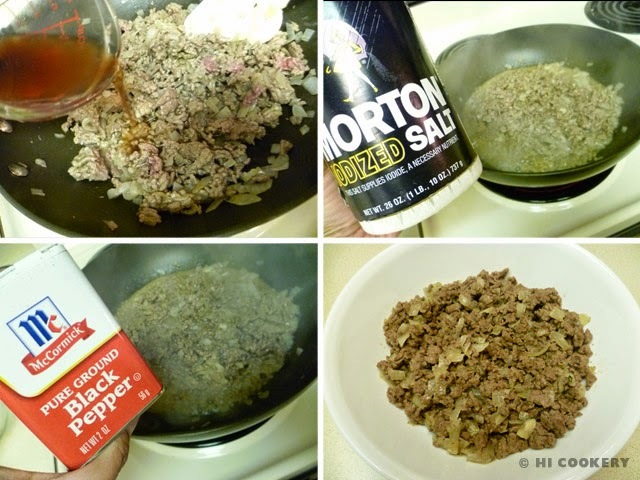 Add the ground beef and cook until no longer pink. Mix in the mustard powder. Stir in the beef stock and cook until the liquid is absorbed. Salt and pepper to taste. 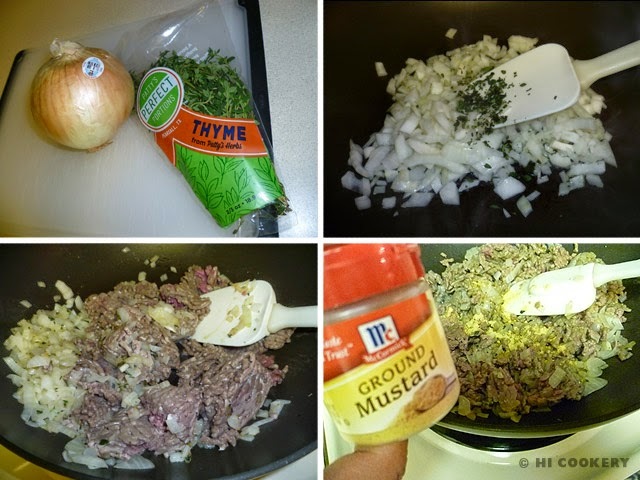 Remove from the stovetop, drain any grease and allow the mixture to cool. 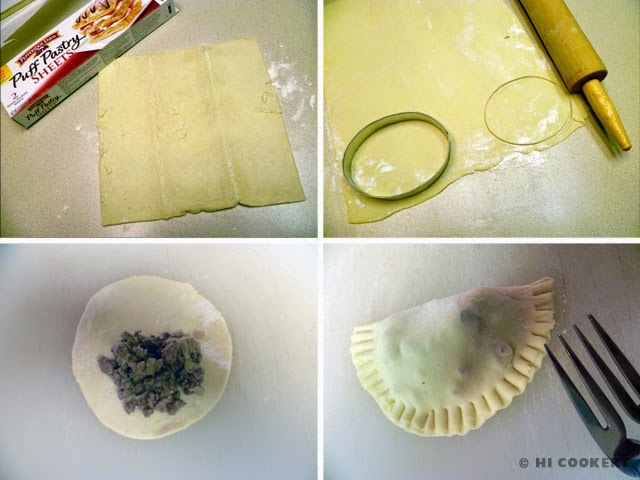 On a clean, lightly floured surface, unroll the thawed puff pastry sheets. Flatten to 1/4-inch to smoothen out the seam of the folds. Cut into 3-inch rounds. Flatten into a horseshoe shape (optional). In the middle of the pastry, place a spoonful of filling. Moisten the edges with a little water. Fold over and press the edges together. Use the tines of a fork to crimp and seal. Place on a lightly greased baking sheet, leaving a few inches apart to allow the pastry to puff up and expand in the oven. Continue making the rest of the mini meat bridies. Beat the egg(s). Brush the tops of each meat bridie with the egg wash. Bake in a preheated oven at 350 degrees F for 20-30 minutes, or until they are golden brown. Carefully remove from the oven. Place on a platter and serve hot. 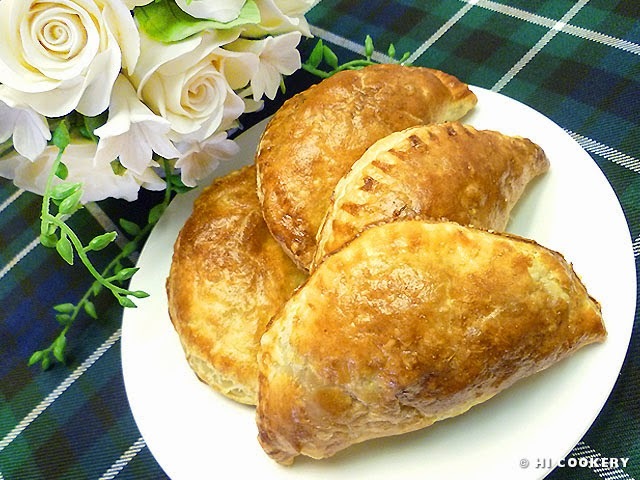 Similar to the meat-and-potato-filled Cornish pasties, Forfar bridies are traditionally made with minced steak, with or without onions, encased in a shortcrust pastry, although flaky (puff) pastry is preferred nowadays. The original recipe uses raw meat before filling the dough, but we sauté our ground beef in seasonings to make sure the filling is cooked through, which saves baking time and prevents the pastry from overbrowning. Some bakers mark the bridies with a hole before baking to indicate the filling—one hole for plain (meat only) and two holes for meat-and-onions; hence, the Scots Dundee dialect statement above. Unbaked meat bridies may be frozen first, then baked at a later time. The origins of meat bridies are uncertain. But one account is that they originated in Forfarshire (now Angus County) and are called Forfar bridies. Another story is that they were named after Margaret Bridie, also from Forfarshire (then Glamis, Scotland), who sold them at the Buttermarket in the 1850s. J.M. Barrie, author of “Peter Pan”, mentioned Forfar bridies in “Sentimental Tommy”. He was born in Kirriemuir near Forfarshire.